The award perpetuates the memory of Professor John Conrad Jaeger who lectured in mathematics at the University of Tasmania from 1936 until WWII, and briefly afterwards, where he enjoyed expounding applied mathematics to engineers. He was Professor of Geophysics and Geochemistry at the Australian National University from 1953 until his death in 1979. Professor Jaeger’s work of the greatest importance related to the physics of heat flow and rock mechanics and he published several classic books in this field. He became a Fellow of the Australian Academy of Science in 1954 and a Fellow of the Royal Society in 1970. The award recognises contributions of the highest order over a lifetime commitment to the geotechnical profession in Australia. The award is not restricted to members of the Australian Geomechanics Society. Nominations should be made by at least three persons (not necessarily members) to the Secretary of the National Committee of the Society following a call for submissions in Australian Geomechanics. This will generally be six months prior to the ANZ Geomechanics Conference at which the award is to be presented. The Chairman of the National Committee shall promulgate a sub-committee of 3 members of the National Committee to consider nominations for the award. The award is made approximately once every four years and is presented at the ANZ Geomechanics Conference. At the Conference, the award winner will present a paper based on the award submission. 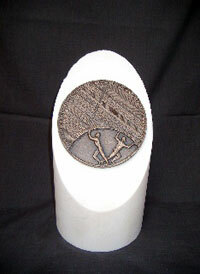 The award memento consists of a bronze medallion mounted on a marble plinth. The award was first made in 1980.